This Special Edition Pattern-booklet, contains full page color photos, sculpting and painting instructions and full size pattern. 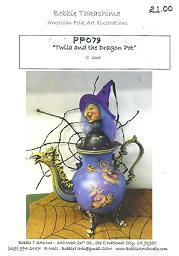 The silver-plated pots are available from Bobbie T. Arts, Inc. The shape and ornamentation of pots vary and are not guaranteed to match the description of the sample. Every effort is made to select pots with similar size and style.